This script allows you to define “skill type groups” based on skill type IDs. Skill type groups are just regular skill types, except they contain skills from other skill types as well. In addition to skill type groups, it also allows you to assign multiple skill types to a single skill so that the skill. The first entry means that skill type 2 contains skill types 3, 4, and 5. 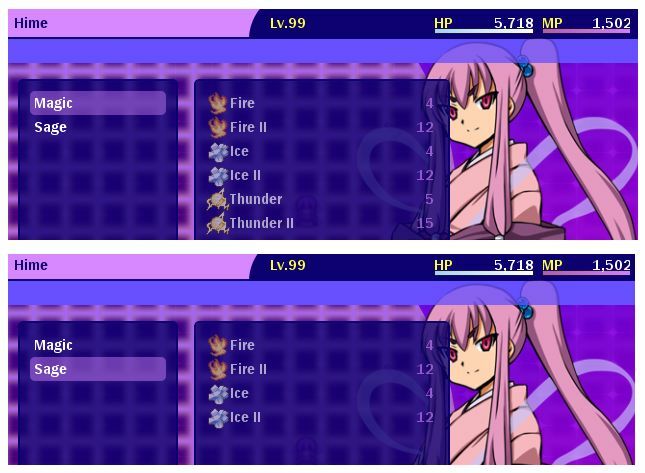 In the screenshots above, “Magic” was skill type 2, and fire/ice/lightning are 3, 4, and 5 respectively. The skill can then show up in all of the specified categories in addition to the skill type specified in the editor’s default box. If you only need one skill type, you don’t need this notetag. There is something annoying me, either I don’t understand this or I’m doing the opposite… but it’s not working. I’m trying to have 4 Skill Type (Offensive/Defensive/Healing/Support) show up on the Skill menu but that in battle it only shows (Spells). Was it made like this? Or I’m doing it wrong? In the configuration section of the script you will type in an entry for your Spells skill type to contain the other 4 skill types. I guess I could move that into a note-tag.